The Global Volcanism Program has no activity reports for Sork Ale. The Global Volcanism Program has no Weekly Reports available for Sork Ale. The Global Volcanism Program has no Bulletin Reports available for Sork Ale. Sork Ale is a silicic stratovolcano located in the Danakil horst SW of Dubbi volcano. Also known as Asdaga, it was constructed perpendicular to the NE-SW orientation of three larger stratovolcanoes (Nabro, Mallahle, and Asavyo) with which it forms the Bidu Volcanic Complex at the southern end of the Danakil Alps. A small, roughly 1-km-wide, 300-m-deep steep-walled caldera is found at the summit. Basaltic lava flows are prominent on the E side of the volcano, and satellite vents are located on the SE flank. The International Association of Volcanology and Chemistry of the Earth's Interior (1973) listed Sork Ale as probably active during the last 2000 years, but Wood (1980, pers. comm.) considered Holocene activity unlikely. The flanks are extensively dissected on the SW to NE sides, but less dissected flows form the eastern-to-southern flanks. The Global Volcanism Program is not aware of any Holocene eruptions from Sork Ale. If this volcano has had large eruptions (VEI >= 4) prior to 10,000 years ago, information might be found on the Sork Ale page in the LaMEVE (Large Magnitude Explosive Volcanic Eruptions) database, a part of the Volcano Global Risk Identification and Analysis Project (VOGRIPA). There is no Deformation History data available for Sork Ale. There is no Emissions History data available for Sork Ale. 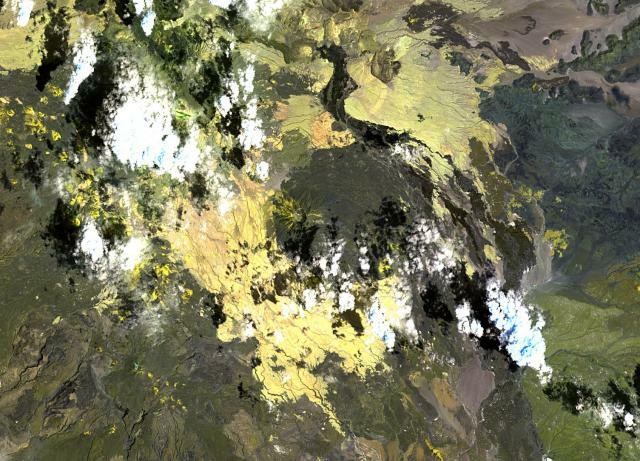 The small, roughly 1-km-wide caldera at the western (left-hand) side of the circular, dark-colored lava field at the center of this NASA Landsat image lies at the summit of Sork Ale volcano. This 1611-m-high silicic stratovolcano, also known as Asdaga, was constructed perpendicular to the orientation of three larger stratovolcanoes trending NE-SW at the southern end of the Danakil Alps. The age of the most recent eruptions of Sork Ale is not certain. There are no samples for Sork Ale in the Smithsonian's NMNH Department of Mineral Sciences Rock and Ore collection. IRIS seismic stations/networks Incorporated Research Institutions for Seismology (IRIS) Data Services map showing the location of seismic stations from all available networks (permanent or temporary) within a radius of 0.18° (about 20 km at mid-latitudes) from the given location of Sork Ale. Users can customize a variety of filters and options in the left panel. Note that if there are no stations are known the map will default to show the entire world with a "No data matched request" error notice. Large Eruptions of Sork Ale Information about large Quaternary eruptions (VEI >= 4) is cataloged in the Large Magnitude Explosive Volcanic Eruptions (LaMEVE) database of the Volcano Global Risk Identification and Analysis Project (VOGRIPA).